Pull garlic mustard with us! We've got plenty of opportunities to help restore river habitat this May. 'Tis the season for garlic mustard removals. If you've skimmed the FMR events calendar recently, you may have noticed a reoccurring theme: garlic mustard pulls. Prime pulling season typically runs from late-April through May. Learn more about this pesky invader and how you can help. Garlic mustard was introduced from Europe in the 1800s for both food and medicinal use. The plant has a prolific growth rate and each plant can produce hundreds to thousands of seeds. Garlic mustard can easily double its plant population in a single year, creating monoculture stands that crowd out native species. Stands of garlic mustard can cover forest floors, threatening the native wildflowers and other herbaceous plants. Wildlife relies on these native plants for food and habitat, and their declines can have cascading effects on overall ecosystem health. Garlic mustard is a disturbance-adapted plant, so methods of removal that cause a disturbance, such as mowing, should be avoided as they will only aid the plant's production. For this reason, simple hand removal is the best method for small-scale infestations. Persistence over time is key. FMR Volunteer Mary T. Furth (left) helps others identify first-year garlic mustard at Crosby Farm Regional Park last spring. Pledge to pull garlic mustard at Pine Bend Bluffs Scientific and Natural Area — Wednesday, May 1 from 6-8 p.m. 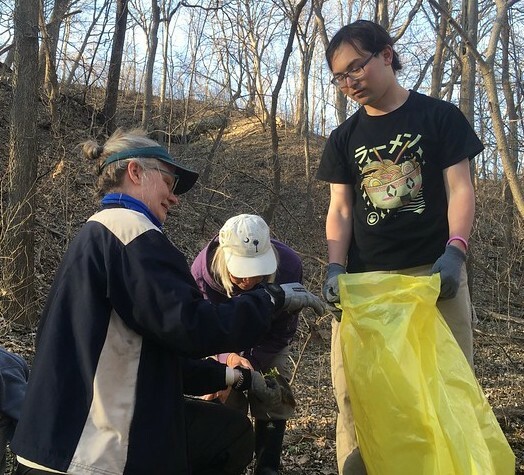 Pull garlic mustard at the first volunteer event at St. Paul Park's Riverside Park — Thursday, May 9 from 6-8 p.m.
Join our biggest restoration project yet! Pull invasive plants at recently protected William H. Houlton Conservation Area — Wednesday, May 15 from 6-8 p.m. Pull garlic mustard at the river gorge sand flats — Tuesday, May 21 from 6-8 p.m.
Garlic mustard removal at the Vermillion Aquatic Management Area — Thursday, May 23 from 6-8 p.m.
No experience is needed. We'll provide any tools and necessary training. However, advanced registration is required and capacity is limited. Sign up today! Contact FMR Volunteer Coordinator Amy Kilgore at akilgore@fmr.org, 651-222-2193 x31 to receive all of the details and precise directions to our meeting spot you'll need. Please include the name of the event, your name, address, phone number and the number in your party. New this year at our volunteer events: invasive species collector's cards! Each card features all the specifics you need to ID a plant in the field plus tips on how to stop invasion. Fits in your pocket. Use it at events or in your own yard (or show it off at parties). Collect all four by signing up for events featuring each invasive. (Bonus: You'll also gain SuperVolunteer status.) Collect the first of the series, garlic mustard, at any of these events. For a different spin, consider joining FMR volunteers Kim and Em at the Water Bar for Bite Back: An edible invasives potluck on May 30. Find more details on our events calendar soon.